The following article is a decade-by-decade look at our story as told in the pages of Scarboro Missions magazine and its precursor China magazine from the inaugural issue in 1919 to the 1990s. Written by Grant Maxwell, this article appeared in two instalments in the January and February 1993 issues of Scarboro Missions magazine as part of the Society’s 75th anniversary celebrations. 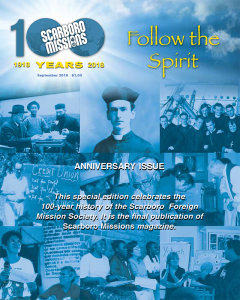 More than 800 issues of the Scarboro Foreign Mission Society’s monthly voice preceded the issue you are now reading. Since 1919 the continuing story of this made-in-Canada missionary community has been told in thousands of articles, regular features, photographs, maps and other items covering some 20,000 pages. Given these mammoth numbers, is an adequate report and analysis possible in two articles? Perhaps, if we limit ourselves to a bird’s-eye view of what China and Scarboro Missions reported and commented upon in one typical year of each decade. I promise to be as objective as possible in selecting typical examples of magazine content. So join me for this flying visit, first to the inaugural issue published in 1919 and then to more than 70 editions published since the middle 1920s. Fr. John Mary Fraser, the Society’s founder and first editor of China, set a lively editorial pace for his successors. His buoyant confidence and dramatic flair are seen in the main news story published in the inaugural issue of October 1919: “China Mission College Meets With Universal Approval” the headline proclaimed. The story reported that Fr. Fraser had “traversed the length and breadth of Canada, preaching in the churches and lecturing in the seminaries, colleges and schools; and everywhere finds the people prepared and eager” to support the proposed college, which first opened in Almonte, Ontario. Now it’s 1926. The Boom-to-Bust Twenties are half over. The stock market crash that triggered the Great Depression is only a few years ahead. During most of the decade W.L. Mackenzie King is Canada’s prime minister. Sun Yat-sen, founder of China’s first republic, has died. Two of his associates, Chiang Kai-shek and Mao Tse-tung, are rivals. George V reigns as monarch of the British Empire. Pope Pius XI occupies the Chair of St. Peter. Fr. William C. McGrath is editor of China. In its seventh year the magazine has 15,000 subscribers. An annual subscription costs .50 cents. “Father Serra’s First Mission Tour”. “There’s a battlefield in China; there’s a war that’s raging now. There’s a mighty army mustering; won’t you join us in Chuchow?” From a poem by “H.F.X.S” (Fr. Hugh Sharkey). The year is 1935, midway through the Threadbare Thirties. Depressed prices for land, sea and factory products, failed businesses, job layoffs and prairie drought bring severe poverty to millions of Canadians. Mackenzie King’s Liberals defeat Prime Minister R.B. Bennett’s Conservatives. The new CCF party elects its first seven MPs. In China General Chiang Kai-shek heads a Nationalist government. His main rival, Mao Tse-tung, is the Communist leader. Adolf Hitler is chancellor of a rearming Germany and Joseph Stalin is dictator of the Soviet Union. Pius XI continues as Roman pontiff. Editor of China is Fr. Alphonsus Chafe. The Scarboro journal has 25,000 subscribers who pay .50 cents yearly. At Scarboro Bluffs east of Toronto, 50 students at the St. Francis Xavier China Missions Seminary prepare to join 18 Scarboro priests already ministering to about 3,000 Catholics in the district of Chuchow; Chekiang Province, not far south of Shanghai. An estimated 1,500,000 Chinese live in this 10,000 square mile prefecture, most of them in cities, towns and villages. The Canadian missionaries have seven mission stations. Scarboro headquarters are at Lishui (formerly called Chuchow) where Monsignor McGrath and six colleagues work. Also in Lishui are five Grey Sisters of the Immaculate Conception from Pembroke, Ontario. The first members of -the nursing and teaching order had arrived in 1930. Only infrequently were their experiences reported in the Scarboro monthly. As in previous years, mission accounts from these Chinese outposts provided the main theme in 1935 issues. From Kinhwa, Monsignor Fraser continued to send reports of his endeavours and also photographs; often pictures of large groups of Chinese adults and chi1dren, formally posed. Other writers included Frs. Gerald Doyle, John McDonald (“who saved a Chinese girl from a pagan marriage”), Larry Beal, W .H. McNabb, Craig Strang (who described a “triumphant Corpus Christi celebration the first great public demonstration of Catholic faith in Chuchow”), Joseph Venini and William A. Amyot. After a brief illness, Fr. James Duncan McGillivray, 42, was the first Scarboro missionary to die abroad. “May his death be fruitful unto the salvation of souls for whom he sacrificed his life,” China’s editor wrote in tribute. The community of Grey Sisters at the Lishui mission composed an eloquent “Appreciation” of Fr. McGil1ivray who had been their confessor. “The Dragon At Close Range”, an interpretation of the Chinese situation by Monsignor McGrath, and “The Anvil of the Cross “, a collection of poems by Fr. Hugh F.X. Sharkey, was promoted frequently in 1935 issues. In a review of the McGrath book, Henry Somerville, editor of The Catholic Register, wrote: “It can be called emphatically an enrichment of the national literature” of Canada. War and Peace in the Forties; 1945 is the turning point. Six years of global conflict end after claiming 50-60 million lives. The Axis powers, Germany, Italy and Japan, surrender. The allies, led by U.S. presidents Roosevelt and Truman, Britain’s Churchill and the Soviets’ Sta1in, preside over an uneasy truce, which the new United Nations is to safeguard. Mackenzie King is still Canadian prime minister. George VI is king of the now shaky British Commonwealth. Pius XII has been Pope since 1939. China has 49,000 subscribers who pay $1 annually. Fr. Sharkey is editor. Monsignor John E. McRae is the first superior general of the Scarboro Society. Monsignor Fraser is back in Canada, temporarily, after his safe refuge in Manila during the Japanese occupation of the Philippines. Several Scarboro priests survived Japanese internment in China during the war years. Other Scarboro members and Grey Sisters also returned safely to their postings in 1944 after having evacuated missions during the Japanese invasion. In 1943 the Society began mission work in the Dominican Republic, the first of many new fields of service to come in Latin America, the West Indies and Asia. Some representative headlines from 1945 editions: “Calling All Catholics” (text of a radio address by Fr. John McGoey); “Chinatown, My Chinatown” (“The colourful story of Vancouver’s Chinese Catholic parish” where Fr. Charles Murphy is pastor); “Letter From Internment” (delayed account from Frs. Michael Carey, Joseph Murphy and Thomas McQuaid, since released by their Japanese captors); “Dominican Days” (in which Fr. Frank Diemert shares some Latin American mission impressions); and “God Is Charity” (“The story of the Grey Sisters of Pembroke in China,” written by an unnamed sister). Now it’s 1955 in the Complacent Fifties. Many Canadians are enjoying relative prosperity after the economic depression and wartime shortages of the two previous decades. Louis St. Laurent is Canadian prime minister. Elizabeth II has been queen for three years. Mao Tse-tung’s Peoples’ Republic of China is in its sixth year. By 1954 the last Scarboro priests and Grey Sisters were exiled home from their Chinese missions. In 1955 more than 100 Scarboro priests are serving in six other nations of Asia, Latin America and the West Indies. China magazine was renamed Scarboro Missions in April 1950 in recognition of this widening apostolate to other lands. Fr. Stringer is editor in 1955 and a subscription still costs $1 annually. In a piece headlined “Through Pain To Paradise”, Fr. Pat Moore told of his “labour of love” in leading the Fatima statue pilgrimage across Canada and beyond. The Diocese of Victoria was one stopping-place on his tour. “Her Plan For Peace”, Fr. Stringer’s book-length interpretation of the Marian messages revealed at Fatima, was promoted and favourably reviewed. Monsignor McGrath added his endorsement in the monthly column, “From the Crow’s Nest”. The year is 1965 in the Turbulent Sixties – a decade of both creative and destructive changes. In China, Mao’s Red Guards spearhead a violent ‘counter revolution’. In North America and Western Europe the ‘sexual revolution’ and ‘Beatle mania’ are two among many significant signs of changing times. In Canada, Prime Minister Mike Pearson’s minority Liberal government, with New Democratic support, introduces national Medicare. In Rome, Pope Paul VI presides at the final session of the Second Vatican Council where over 2,000 bishops are initiating a far-reaching renewal of Catholicism. Just before the Council was to open in September 1962, Scarboro’s founding father, Monsignor Fraser, had died in Osaka, Japan, 60 years after his first mission journey to the Orient. Still costing only $1 a year, Scarboro Missions is edited by Harold Oxley. The social upheavals of the 1960s and especially Vatican II had a lasting impact on the monthly magazine. In 1965 and succeeding years, readers witnessed an accelerating transformation in the periodical. Compared to what subscribers had read in previous years, the editorial emphasis, much of the content and eventually the overall appearance changed dramatically. Mission experiences far beyond Canada still received priority attention. Instances: Fr. Tim Ryan described the maiden voyage of the Santa Teresena, Scarboro’s 40-foot houseboat on Brazil’s Amazon River. From Japan, Fr. Thomas O’Toole reported that Western customs had become so common they were no longer considered novelties. Fr. John Bolger described a coal miners’ retreat at Kaize, Japan. Fr. Vincent Daniel wrote about the training of lay catechists in the Brazilian jungle. Editor Oxley found time to compose several articles on Scarboro mission efforts in British Guyana. Besides the monthly editorial, other regular features (departments) in 1965 included I Remember, one-page accounts of vivid experiences by Scarboro members; Come Follow Me, reflections by Fr. George Courtright, vocation director; short items of Mission News, and Scarboro’s Junior Missionaries, now reduced to one page. It’s 1975 in the Indulgent Seventies. Washington and Moscow are the main adversaries in the Cold War’s escalating arms race. Pierre Trudeau is Canadian prime minister. Governments and citizens alike are spending freely. Paul VI calls on Catholics to observe a Holy Year by practicing reconciliation of differences and injustices. Scarboro Missions begins the year with Fr. John Walsh as editor, soon to be succeeded by Fr. Gerald Curry. Writes the outgoing editor: “I wish Fr. Curry many miracles, and hope he will perform a few of his own.” When he takes the chair, Editor Curry promises readers he will aim for “a balanced diet” of magazine fare. Annual subscriptions cost $2. Subscribers number 41,000. “Church, what do you say of your future? Are you going to give up the means of power, the compromises with political and financial power?” asked world youth assembled in Taize, France. Scarboro published their “Letter to the People of God”. Janet Somerville, well-known Catholic journalist, concluded a four-part series on world development and the Bible. “Can we expect the spiritual blessings of renewal and reconciliation if we are not willing to live brotherhood in an economic sense?” was her challenge for the 1975 Holy Year. Theologian Gregory Baum analyzed the relationship between personal and social sin. The June issue was dedicated to the memory of Fr. Art MacKinnon, shot to death 10 years before in the Dominican Republic. There were accounts of his martyrdom and that of 10 other priests and religious in Latin America. Fr. Frank Hawkshaw described the Society’s Fifth General Chapter in 1974. One major decision invited single men to join Scarboro’s missionary apostolate whether they chose to be ordained or remain laymen. In coming years the Society would train and commission both men and women as lay missioners, dozens of whom would serve alongside the declining ranks of Scarboro priests. Scarboro’s Book Department advertised five works by Fr. McGoey, including his Nor Scrip nor Shoes, and Agent for Change, author Gary MacEoin’s account of Fr. Harvey Steele’s apostolate of cooperatives and credit unions in Panama. A survey of Scarboro Missions readers found the majority were “veteran mission supporters.” Readers said personal stories about individual missionaries were the most favoured articles. Similarly, “Faces in Focus” and “I Remember” were “overwhelming favourites” among the magazine’s regular features. Year 1985 in the Uneasy Eighties. President Reagan has a new opposite number in Moscow: Mikhail Gorbachev, who soon calls for an end to the Cold War, including its runaway arms race. Meanwhile famine, disease, debt, oppression and civil strife escalate in most Third World countries. Canada’s Prime Minister Brian Mulroney leads a new Progressive Conservative government. Pope John Paul II continues papal visits to every continent. Fr. Jack Lynch is editor of Scarboro Missions, now a full-colour publication. Subscribers total 43,000 and pay $5 annually. Various global themes were examined in most 1985 issues. The United Nations’ International Youth Year was the first cover story. The state of the Catholic Church in Cuba was examined in articles reprinted from Missions Etrangeres, published by the Quebec Foreign Mission Society. Several Latin American bishops who witnessed to “the faith that does justice” were profiled, and tribute was paid to Archbishop Oscar Romero of El Salvador, assassinated five years before. The justice themes Pope John Paul stressed during his 1984 Canadian visit were recalled. Some of that year’s regular features: The Global Parish reproduced reports and talks from many quarters. Focus on Facts provided data on missions around the world. The Word offered various contributors’ insights on the Scriptures. Fr. David Warren examined the Missionary Vocation issue by issue. The ever-popular I Remember column continued as before. Scarboro members who shared memories included Frs. Charles Gervais, Frank Moylan, Rogers Pelow, John O’Connor, John Gault and Robert Cranley. As well, Scarboro personnel, including lay men and women missioners, shared Personal Reflections. Five years on we reach the Uncertain Nineties – a new decade of much promise and peril. In 1990 the old ‘world order’ is crumbling and a so-called ‘new world order’ supposedly is emerging. In Canada Prime Minister Mulroney’s government is in its second term. Constitutional renewal based on a Meech Lake agreement is heading for failure. Fr. Gerald Curry again is editor of Scarboro Missions. Subscriptions are $5 annually. There are 36,000 subscribers. “Creation Spirituality” was the main theme of the first 1990 issue. Sr. Anne Lonergan, RC, began a three-part series. Fr. Bob Ogle’s guest editorial declared: “I believe that our culture misread the Biblical story, and the care that our Creator demanded became the abuse of creation. I feel that a new acceptance of the ‘gospel of Genesis’ is a key to any turnaround.” Other contributors to this ecological theme included Mark Hathaway, lay missioner in Peru, and Rene Fumoleau, OMI missionary and supporter of the Dene Nation in the Northwest Territories. Other global themes explored in succeeding editions included the debt, crisis in the Third World, “Third World Solidarity Day”, and “Interfaith Dialogue”, which presented an interview with Professor Ovey N. Mohammed, SJ. “Not only can people from different religions pray together, they can also teach each other how to pray better,” he said. Paul McKenna wrote on “Understanding Hinduism” and Toronto teacher Ted Schmidt contributed a two-part article on “Education for Justice”. One issue was devoted to “Scarboro in Japan”. A dozen Scarboro members shared mission experiences and insights. They included Frs. Dave Fitzpatrick, Cleary Villeneuve, Ben Schultz, James Gauthier, Alex McDonald, John Bolger, Thomas Morrissey, Edgar Geier, and Don Boyle, who coordinated the issue. By 1990 a total of 32 members had served in Japan, including the current editor. Tom Walsh, coordinator of Scarboro’s Department of Lay Association, described 12 years of mission life he, his wife Julia and children had experienced in Peru and Panama. As well in 1990, as a new member of the Canadian Church Press, an ecumenical group of over 70 Christian publications in Canada, Scarboro Missions won recognition among colleagues at the annual Church Press convention.